The battle for green energy customers seems to be heating up after Ecotricity complained about rival supplier Good Energy to the Advertising Standards Authority (ASA). It suggests competition for customers is increasingly being fought on an ethical basis, especially since many of the UK’s larger suppliers backing away from green energy tariffs. Ecotricity – a supplier which uses its customers’ bills to pay for building new renewable energy projects – challenged whether Good Energy’s claim to be “the UK’s leading 100% renewable electricity supplier” on its website was misleading and could be substantiated. The ASA upheld the challenge and ordered the ad must not appear in the same form again unless the claim could be substantiated. 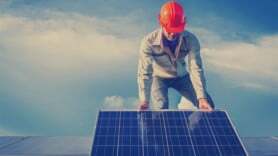 When defending itself, Good Energy had argued it was the only company solely dedicated to sourcing 100% renewable electricity to replace the power used by its customers which comes from the grid, while other renewable suppliers offer some ‘non-green’ tariffs. However the Authority ruled people might read the word “leading” as suggesting Good Energy has more customers than other firms with 100% renewable tariffs. Ecotricity has just under 75,000 customers on the books while Good Energy, a younger supplier, has roughly 34,000. Juliet Davenport, CEO of Good Energy described the ruling as a “shame”.